HARTFORD, CT—You kind of know you’re watching a show in Connecticut when an hour and a half after doors open the line to get in has barely moved. The Webster is a bit deceiving; I was expecting a Knitting Factory-sized place, maybe enough for 100 or so people, which had me wondering how bad Mudvayne did on record sales their last album out. Luckily they didn’t do too badly. Opening act Nonpoint carried a familiar sound to that of the headliners. The four-piece band is touring without one of its original members, guitarist Andrew Goldman, who dropped out last year. Despite the shakeup, replacement Zach Broderick was welcomed not only by the band but by the abundance of Nonpoint fans in attendance. Once the band got going the bass and guitar riffs were almost immediately reminiscent of Mudvayne. Song after song I felt like vocalist Elias Soriano fused alternative style singing with some rapping similar to what Chad Gray did early on in L.D. 50. One thing I will say is that they have a huge presence behind the drum kit. Robb Rivera is a big dude. 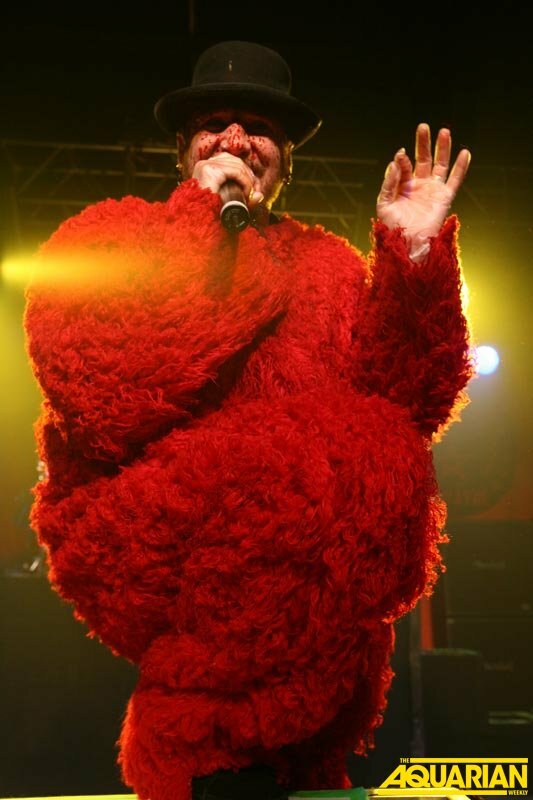 He was pressed up against Mudvayne’s kit and couldn’t squeeze in front of it. He was forced to turn his entire kit towards the wall and had to sit side ways the entire set. Although his kit is relatively small the sound was crisp and heavy. Some songs stuck out more than others including the band’s anthem-like tune, “Bullet With A Name.” The entire place erupted. I wish I knew a bit about that song before I heard it. It got the place going good enough that I almost found myself on the floor about two seconds into it, ill prepared. They also played a cover of Phil Collins’ “In The Air Tonight,” that was very unique to say the least. A decade-plus and the band is still churning out records. Songs off their new album transitioned very smoothly with their older stuff. It was hard to tell the old from the new apart even though their album versions sound somewhat distinguishable. The first song was pretty indicative of what was going to come. 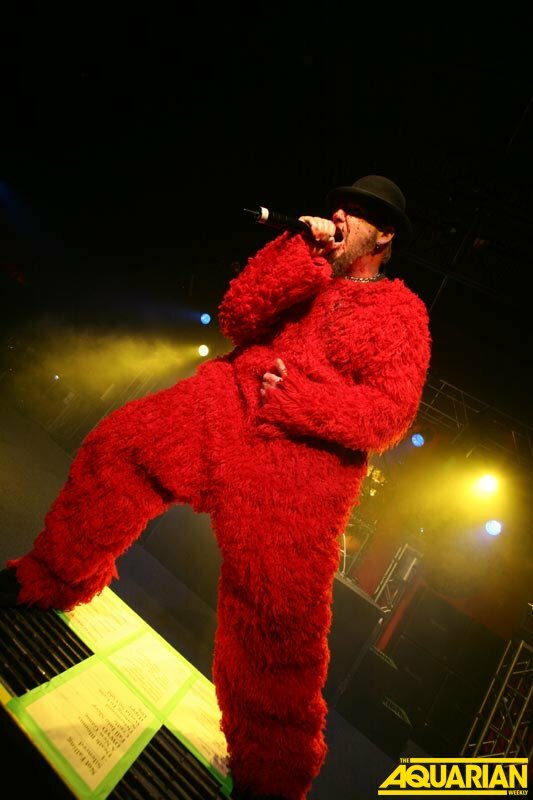 They opened with “Not Falling” and continued with three more old songs, “Silenced,” “-1” and “Death Blooms.” From the start to the end of their fifth song, “A New Game,” Chad was in what could only be described as a red gorilla suit. He wore just the body piece—nothing over his head. He had a bandana on that was covered with what looked like blood. 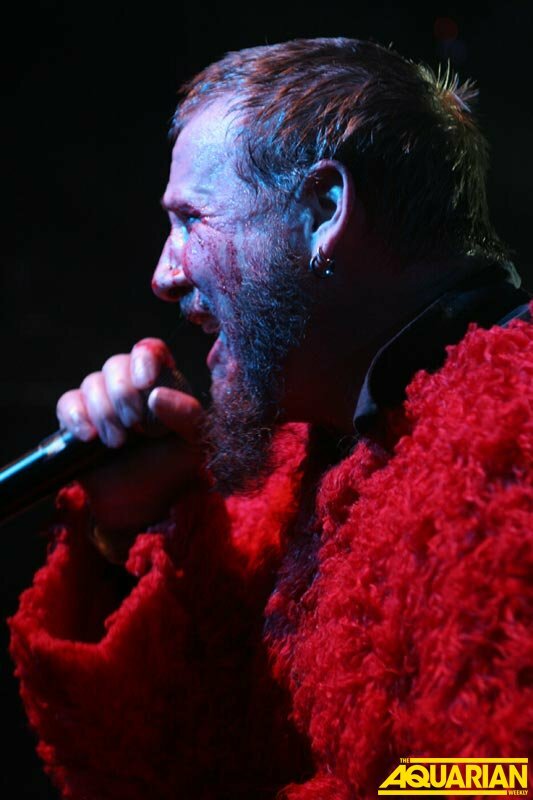 If you’ve never been to a Mudvayne show you can imagine what the fans were like as they watched Chad beat himself to oblivion on stage. The pits in the back of the theater were evidence enough that the music was coming across loud and clear. Of course for the most part Chad seemed a little disoriented. It took him a while to catch up with the lyrics and the constant fist-punching to his head didn’t seem to help. Everyone was quick in aiding and no one looked really distraught over the miscues. The entire set featured at most three new songs, everything else was old; the brunt of the songs came from L.D. 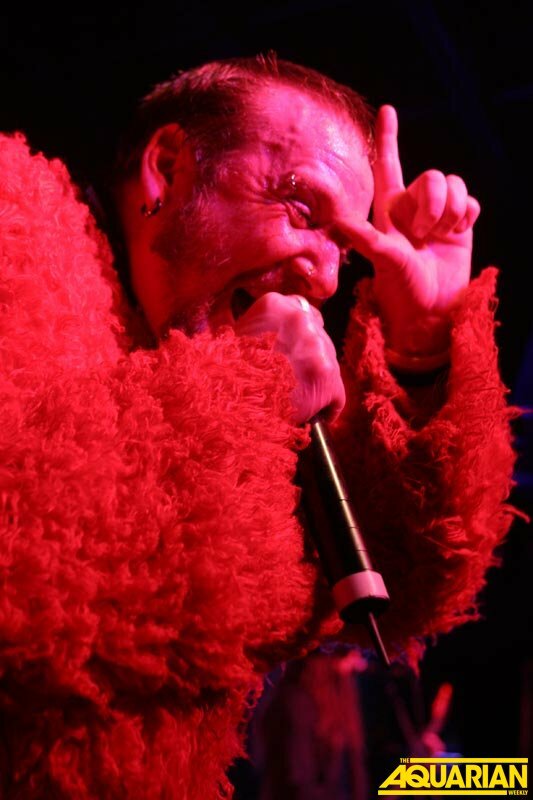 50 including “Nothing To Gein.” The fans were pumped at the prospect of hearing this song live and when the first few chords were played it was like he was playing “Dig.” Chad pushed himself to the brink of sickness puking on stage as he was down on his knees.